What does a lynx look like? 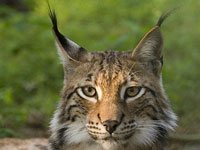 As a member of the cat family, lynx share many of the same characteristics as other cats, such as tigers, jaguars, leopards and even the family cat, acute hearing, sharp eyesight and excellent climbing ability. Lynx are covered with beautiful thick fur that keeps them warm during frigid winters. Their large paws are also furry and hit the ground with a spreading toe motion that makes them function as natural snowshoes. 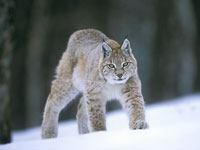 The lynx is a solitary cat that haunts the remote northern forests of North America, Europe, and Asia. Humans have had a profound effect on the status of lynx in the wild. The Spanish lynx once roamed over large parts of the Iberian Peninsula, possibly as far north as the Pyrenees. Today, they are very rare and can only be found in restricted and confined wetlands of southwest Europe. 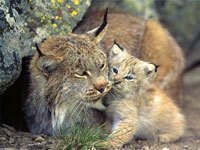 The Spanish lynx is now protected by law. The Eurasian lynx made its ancestral home in mixed forests. Due to human activity this East Asian animal has been forced to find new ways of living in open woods and on rocky mountain slopes. Even with conservation efforts, the lynx is struggling because of hunting by farmers, who view them as pests, road kills and a mysterious loss of male cubs possibly caused by a genetic problem. What does a lynx eat? All lynx are skilled hunters that make use of great hearing (the tufts on their ears are a hearing aid) and eyesight so strong that a lynx can spot a mouse 250 feet (75 meters) away. Canada lynx eat mice, squirrels, and birds, but prefer the snowshoe hare. 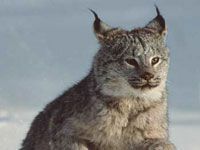 The lynx are so dependent on this prey that their populations fluctuate with a periodic plunge in snowshoe hare numbers that occurs about every ten years. Bigger Eurasian lynx hunt deer and other larger prey in addition to small animals. What are the natural enemies of the lynx? Did you know this about the lynx? 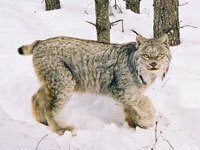 The Canadian lynx depends almost exclusively on the snowshoe hare as prey. 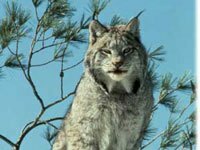 A regular fluctuation in the snowshoe hare population every 10 years directly impacts the lynx. The lynx's large, padded paws are an adaptation to walking on snow, which allows them to travel and hunt in their snowy, high altitude habitats. Download free Lynx wallpapers, click on the image to open the large version. Print free Lynx coloring pages, click on the image to open the large version.